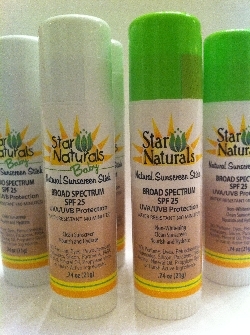 "Star Naturals is a healthy, clean, chemical-free sunscreen line. The main ingredient (USDA certified) Organic Sweet Almond Oil protects and conditions the skin leaving a more youthful glow without a greasy residue. Star Naturals was developed using a physical blocker (Zinc Oxide) to immediately protect skin from harmful UVA/UVB rays. Natural Vitamin E (tocopherol) was added as a second line of defense to help absorb free radicals that can cause premature aging and skin damage." I tried the Baby Natural Sunscreen Stick on my daughter who is 7, the one with vitiligo. She had it on her face and hands. I felt that the 25 SPF was not high enough for her situation. Also it states it is water resistant but she would end up with water on her face and wipe it off with a towel.. it isn't towel resistant. No fault of the Star Naturals product. The naturalness of it made it go on a little harder than the sunscreens that add chemicals to thin it out. You will need a little more patience, but in the long run using products without all of the harsh chemicals is going to be better for your child. Fantastic size for putting in your purse so if you end up outside for an extended period of time you have sunscreen readily available! Want to give it a try? Enter to win a set of 3 Natural Sunscreen Sticks valued at $35 by using the rafflecopter for entries!! USA Only, Ends July 24th. Stay cool this summer and beat the heat!! Staying inside. I'm 6 1/2 months pregnant in Texas, so if I'm not swimming I'm inside. Fans, A/C, going to cheap movies, playing at the library, and waiting until later in the evening to go outside. Lots of playing in the water!! Staying in the A/C and eating lots of homemade popsicles! We are mostly staying inside the house(air-conditioned), and if we go outside, it usually involves water!! A/C, Ice water and Popsicles! Staying inside! Or playing in water outside! I'm trying my best, but man it's hard when you're pregnant! I always have water on hand, use sun protection, find a shady spot when we're outside, and keep my fridge stocked with hydrating produce. I stay inside with the AC on or swim in the pool! Staying inside. We are also going to the pool alot. I'm lucky to have a/c so we stay inside on the warmer days.